Dalbir Singh, who was Sachin’s room-mate when they were 15 years old, is grievously hurt in a 2002 motorcycle accident with a tanker. He suffers multiple brain injuries and is in coma for eight months. His “tormenting wife” allegedly keeps him locked up in a tiny room for a year before he is rescued by police. Sachin hears of Dalbir’s plight, gets in touch with him and refers him to his orthopaedic, Anant Joshi, for hip surgery. 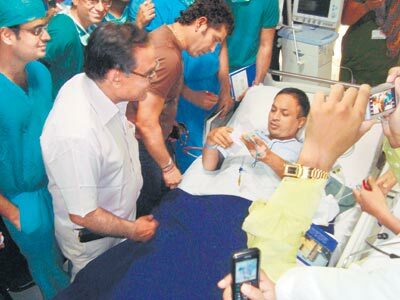 Sachin visits the hospital (in picture), spends time with him, and picks up the bill. For Vishwanathan Anand‘s chess title defence, Kasparov, who beat him in 1995, and Karmnik, whom he defeated in 2008, “connect, consult and conspire” for the downfall of Veselin Topalov. This entry was posted in Cricket, Etcetera, Life Etcetera and tagged Chess, ChessBase, Churumuri, Garry Kasparov, Magnus Carlsen, Vishwanathan Anand, Vladimir Kramnik. Bookmark the permalink. ← ‘Either you are with us, or you are with them’? That’s what differentiates Sachin from the rest. The human values taught by his parents and the near ones. He is humble even after his goliath like achievement. His personal friends who have seen him from childhood, say that he is still the same sachin as he was before his journey to this landmark. He still adores his coach Ramakanth Achrekar. It is difficult to achieve anything with hard work alone, you need the blessings of many people and many people who want you to achieve. I am sure Sachin has millions of people on this planet who have prayed for him when he hurt his back, wished him when he walked out to bat and cheered him when he was down. This power of people with his humility and hard work has made him a colossus in sports. There are people who can say hundred things against hundred people in any walk of life. But when it comes to Sachin they can only bless him. Good Sachin is at it now. We know of Wogue! One of the most erudite article in churumuri. Apt pictures and classy techno savvy Exhibit B article reduced to simple terms. It is interesting to note Vishy was supported by kasporov and Kramnik. Proves that true intellect is one that has no jealousy. What is the f****ng point that is being attempted here? Sycophancy is good for the Congress not for Chrumuri. Goes to show that Kasparov, Kramnik, Anand and Sachin are true champions. Hmm. You help your friend, proves you are a champion. You come together(read conspire) to topple the top, proves you are a champion. Hello, what exactly does that have to do with super star. Would you not help your friend if you weren’t a superstar. Would you not try to topple the top, on your own, if you weren’t a superstar. What they did just hits the limelight faster, that is all it proves. we are all ordinary mortals and we chip in when our friends are down. The point here is although he is a star celebrity he still has his foot on ground unlike many others who pretend ignorance in these matters. Having money and parting with it is one thing and being present and empathising and using his sources to help a friend is a special one. Sachin could have wrote a cheque or sent somebody to do that. I think Anand is a textbook exception to the adage “Nice guys dont finish last”… First of all, he is a champion while also being a nice guy – Even in victory, when some journalists (esp. in NDTV) wanted to show him as the guy who “trounced” or the guy who “gave hope to Topalov” till the 12th round – Anand would have none of it. He was still true to his roots and handled the questions gracefully! More than him winning the championship, I think its a first that so many people have collaborated or conspired to see that their guy comes through. In a truly me, myself game like chess which has a history of nasty GM’s, this is something significant. Agreed that not all of their helping tendencies were altruistic, but I feel that only a guy liked Anand could have achieved this – I mean I dont expect to hear a similar news headline for Kramnik – actually, I should correct that – Anand might have been there to help him – because he is a hopelessly nice guy! What are the possible answers!!!! Do you have to be champion for shutting their mouths? the same would have done by any two bit famous starlet/reality tv winner.